I don’t think I’m the only one who feels like we’re having an absolutely magical spring in Santa Barbara. The flowers are blooming brightly, the sunsets have been magnificent, and the ocean seems to have an extra sparkle. Most striking of all is the green. The lawns, the fields, and the hillsides are bursting with color — everything is as green as can be. 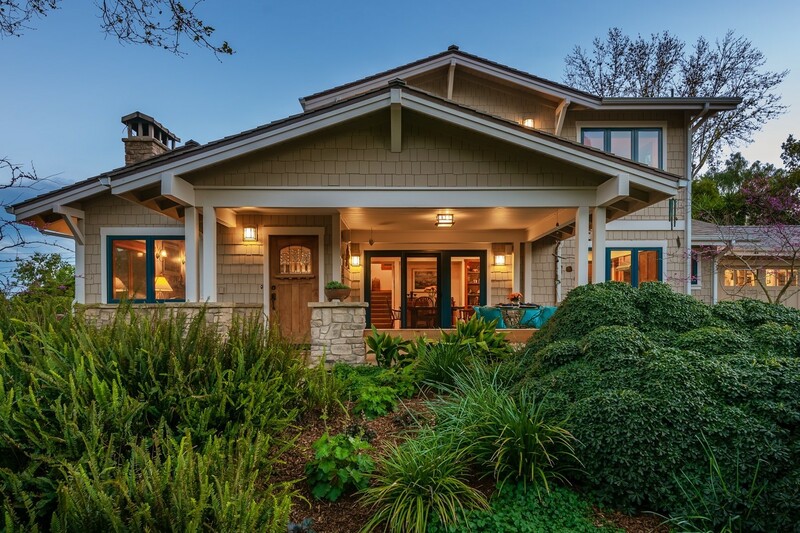 The home for sale at 869 Clark Road in Santa Barbara has earned recognition for being a different kind of green. It was completely remodeled in 2006, and it received the highest possible ratings from both the Santa Barbara Contractors Association’s Built Green Program and the Santa Barbara County Innovative Building Review Committee. In addition, the project won a national award for excellence in “whole house remodeling” and was featured in a local tour of green homes in 2006. Designed by architect John D. Kelley and rebuilt by renowned green-builder Allen Construction, the house features energy-efficient details and solar-powered systems from top to bottom. The windows, the electric and heating systems, the paint, and the hardwood floors are all either solar powered, chemical free, or energy efficient. I knew about these accolades before I visited, but as I walked through the house, I was much more taken by its magical ambience, both inside and out. Charming details caught my attention at every turn, and the views from every room are spectacular. The front yard has a vibrant garden, with orange poppies, purple lantana, red geraniums, and bold succulents jostling for attention along terraced pathways and stone staircases that lead up to both a big patio and the more formal front porch entry. Fruit trees include lemon, fig, orange, and avocado. While walking up the meandering paths, multiple seating areas offer inviting spots to pause and enjoy the surroundings. The house itself is traditional Craftsman-style architecture, with a columned, covered front porch. Stepping inside, the living room has a striking stone fireplace on one wall, built-in bookcases, wood-framed windows, and beautiful vaulted wood-beam ceilings. The living room leads into an open dining area and the kitchen beyond, with granite counters, cherry wood cabinets, and stainless-steel Viking appliances. Big French doors from the dining room open out onto a covered patio, ready for outdoor entertaining. There was a lot to admire as I walked through these rooms, but the gleaming, textured hardwood floors kept drawing my attention. In this super green home, I suspected that the floors were made from reclaimed wood, but I was intrigued to learn that the wood was salvaged from railway ties from Thailand; untreated, and chemical-free, of course. The ground floor also holds two bedrooms with a full bath in between. One of the bedrooms is currently set up as a den. Both this room and the living room have doors that open onto the large patio on the front of the house, which offers beautiful views. There’s also a pantry behind the kitchen with doors that open to both the garage and the driveway outside. Even the driveway is remarkable in this home. Its huge textured pavers have groundcover growing softly between them, and an area along one side has a profusion of succulents, with benches from which to enjoy it all. The second story is completely filled by the master suite. This sanctuary includes a walk-in closet, a gorgeous bathroom with a luxurious shower and bathtub with a view, plus clever custom cabinetry on the dual sink that provides extra storage and display space. Two balconies on this level enjoy a treetop vantage point and gorgeous mountain views. Back downstairs, I stood on the front porch to admire the garden again before I left. Amid all the green, a silver-barked tree with tiny pink flowers and perfectly heart-shaped dark red leaves caught my eye. This sweet red bud tree suits this romantic house to a tee. While this home’s claim to fame might be its award-winning green pedigree, its craftsmanship and charm are what won me over, and are what will likely “romance” its next owner to fall in love. 869 Clark Road is currently for sale in Santa Barbara, listed by Louis & Susan Manzo and Brittany Lough of Village Properties. Reach Louis & Susan at 895-6918 and Brittany at 455-5736, or email info@yoursbhometeam.com. For more info, visit yoursbhometeam.com.